Peep Show, Spaced, The Inbetweeners, Friday Night Dinner, Father Ted, The IT Crowd and more are coming to Lovefilm's streaming line-up thanks to a new deal with Channel 4. 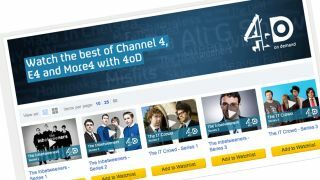 Heading Lovefilm-wards in a specially branded 4OD section of the site, the Channel 4 programmes will boost the Amazon-owned streaming service in the television department. A report issued at the end of last week showed that while Lovefilm is ahead of Netflix in the movie-streaming stakes, the newer-comer takes gold for TV content. Indeed, Netflix has had the Channel 4 line-up available to stream for some time now. As well as newer shows like Peep Show and Friday Night Dinner, the deal brings a few Channel 4 classics with it, including Spaced, Queer As Folk, Teachers and Father Ted. And all available to stream for just £4.99 a month. As Mrs Doyle would say, "Ahh go on, go on, go on, go on, go on." But then again, in the words of Father Jack, "Feck! Arse! Drink! Girls!"